Banh xeo seems to be designed to be eaten as a family. The batter, filling ingredients, and veggies aren’t complicated to prepare, but they don’t make sense to be bought or made to be eaten by yourself. 1. Finely mix the rice flour, turmeric powder and salt. Add water and coconut milk and whisk well until the ingredient is smooth. Sieve through to ensure no lumps inside the mixture. Rest the batter for 30 minutes. 2. Use a large fry pan or non-stick saute pan, heat up with high heat. . Add 1 tablespoon lard/oil and then add one portion of pork, shrimp, onions, scallions, and mushrooms (and salt to taste) to stir fry until the pork and shrimp are half done. 3. Add in 1/2 cup of batter into pan, swirl pan to coat bottom evenly. Add bean sprouts over one half of the crepe. 4. Drizzle in 1 more table spoon of lard/oil around the edge of crepe and lower heat to medium. 5. Cover pan and cook for 1 minute. Remove cover and continue to cook until edges begin to brown. 6. Loosen crepe from bottom of pan with a soft silicon spatula (hard spatula would break the crepe). 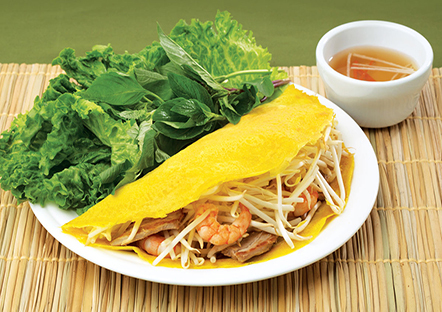 When bottom turns light brown and crispy, fold crepe to encase bean sprouts. 1. Add fish sauce, water, sugar and lime juice into a small bowl and mix well until sugar is completely dissolved. 2. Add garlic and chilies and stir, serve as tableside condiment. 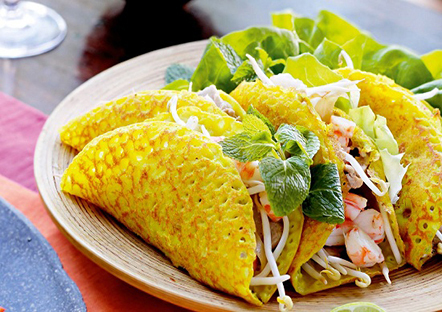 Roll pieces of cooked Banh Xeo in a lettuce leaf, dip in Nuoc Cham sauce and eat immediately.